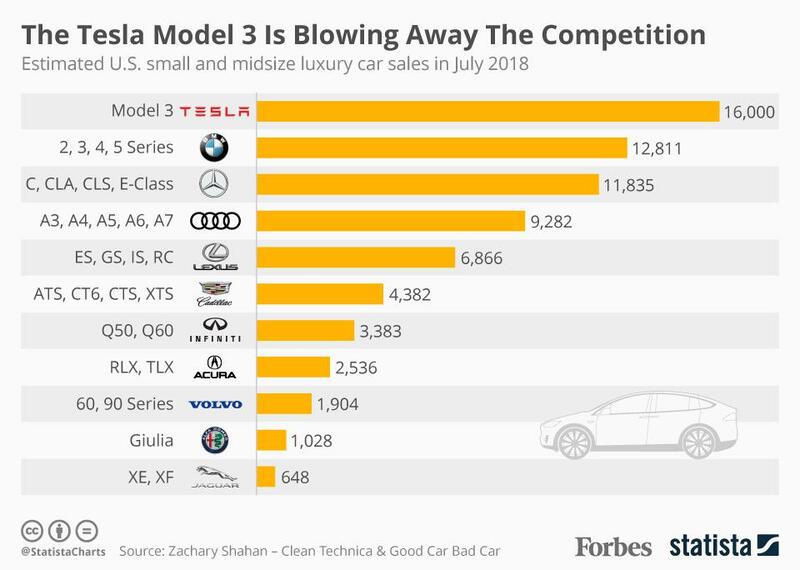 A new analysis claims that the Tesla Model 3 is crushing its competitors in the small and midsize car sector with total estimated sales for July amounting 16,000. The closest individual model to Tesla's mass-market endeavor is the Mercedes C-Class and even then, its July sales are estimated at just 6,029 units. The Model 3 is still untouchable when sales figures from multiple vehicles produced by the same company are added together. Yes it is positive, but then if you factor in what percentage of the overall market small to midsized luxury cars are it isn't as smashing. Coming out with these numbers two days left of the month is silly and suspicious. Goldman did the same exact thing. Probably going to get downvoted for saying this, but obviously the Model 3 is going to sell well. This isn't fair comparison since hundreds of thousands of people have put in pre-order and are still waiting for their unit. Wait until Tesla fulfills their backlog of pre-orders first and then we'll see how sustainable these monthly sales numbers are. Interesting news. Thank you Vlad. What I take away from this is that there is a TON of competition coming on line by some serious players and a probable big reason for the sales figures is the hype associated with Tesla. It just doesn't make the case that they dominate the field in such a way that would make it possible to even pay back the debt owed by Tesla. But I'm no expert. I love the concept and I would venture to say that Elon has done a tremendous job of making the world aware of the advances in electric transport and how to develop the self supporting infrastructure to support it. Will that mean that Tesla even survives? I guess time will tell. This is a fictious claim.The Model 3s listed were NOT sold in the month of July, at least not this July. They were DELIVERED in the month of July, most probably bought years ago.